Traffic Mining is the art of extracting hidden, obfuscated or encrypted information from IP traffic, by only observing the Layer 2 - Layer 4 header features. It exploits the fact that nobody produces perfect and secure code when writing internet applications. The key point are libraries used by every one, such as codecs. They have intrinsic features and physical characteristics which cannot be changed without impeding correct functionality. This characteristic behaviour reflects itself in Layer 3 and 4 header features, independent of any encryption on Layer 7. A prominent feature is the packet length (PL) and the inter-arrival time (IAT), also known as packet interdistance, of the consecutive packets in a A or B flow. The major work in classification of encrypted traffic is the quality of the preprocessing. Hence, T2 focusses on what type of data should be fed into a classifier or a feature selection mechanism to produce optimal results. In the following we will discuss these preprocessing approaches using the traffic skypeu.pcap, which contains a simple voice conversation between two peers. For illustration t2plot, a wrapper for gnuplot is used. Normally this should not happen, because the NODEPOOL factor in pkSIATHisto.h is set to 17, which suffices for a large tree of PLs and IATs. Nevertheless, then increase the NODEPOOL_FACTOR to 18 or a bit higher, recompile and see what happens. It is a multiplication factor with the hashChainTableSize, denoting the maximum amount of flows in memory at a specific tim, defined by HASHCHAINTABLE_BASE_SIZE in tranalyzer.h. So be careful, each flow uses suddenly a considerable amount of memory, if you turn up the NODEPOOL_FACTOR unnecessarily high. [INF] Hash Autopilot: main HashMap full: flushing 1 oldest flow(s)! Fix: Invoke T2 with '-f value' next time. So now you are all set for any pcap mishap that might hit you in future. Let’s start with the TM statistical approach. To profile traffic, the flow representation is the most convenient one, because the nature of a traffic type can be compressed into a collection of numbers, e.g. a vector, which then can be postprocessed by standard programs such as SPSS, Matlab, Excel or an AI plugin. For now we are intereseted in column 100 of skypeu_flows.txt, designated Ps_Iat_Cnt_PsCnt_IatCnt. It contains a 3D statistics and their projections onto PL and IAT. or look at the projection, the packetlength statistics. It contains information about the application. Sometimes the IAT statistics bears some information about the application and the user. 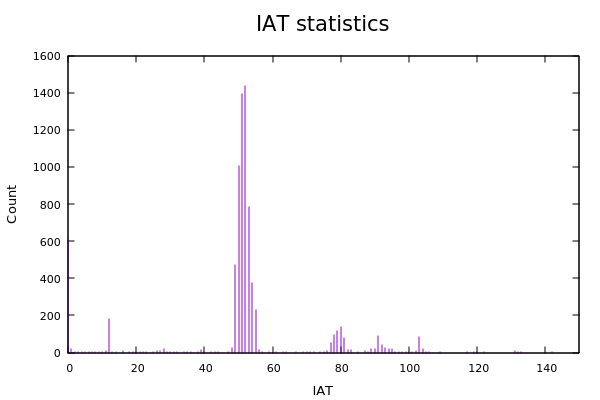 But often the IAT alone is not significant. Using the -r option, all online features of gnuplot can now be used. 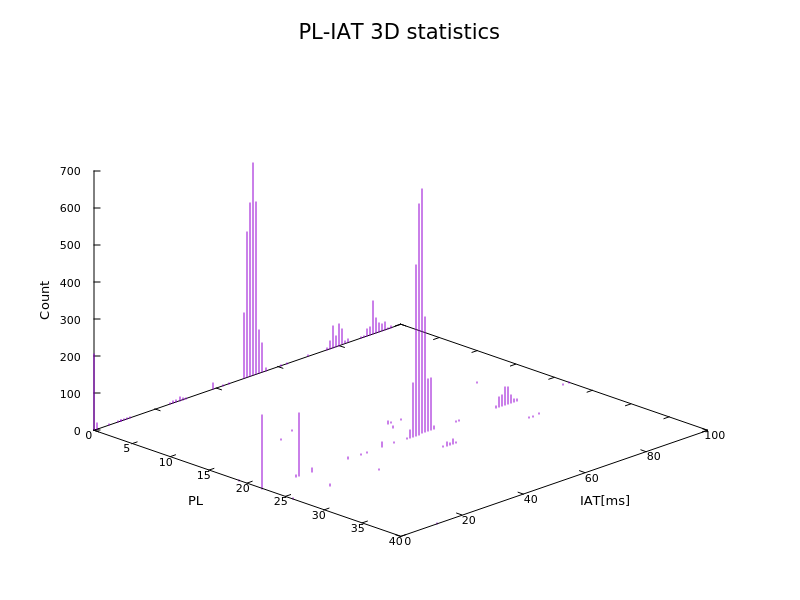 The pl_iat, pl, iat distribution can now be fed into a classifier of your choosing. and look into the .h file. For non C literate: The “//” denotes a comment in C, it has not effect on the constants; only change the values right after the constant with a editor of your choice. Change come into effect if the plugin is recompiled. #define HISTO_PRINT_BIN        0 // 1: Bin number; 0: Minimum of assigned inter arrival time. To conserve flow memory space, the resolution of the IAT distribution can be flexibly configured to match the needs for the classifier. E.g. for Voice applications the region between 0-400ms need to have a higher resolution than IAT $ 1s. For other appliications it might be different. Hence, six sections are predefined, three are activated by setting IATSECMAX. 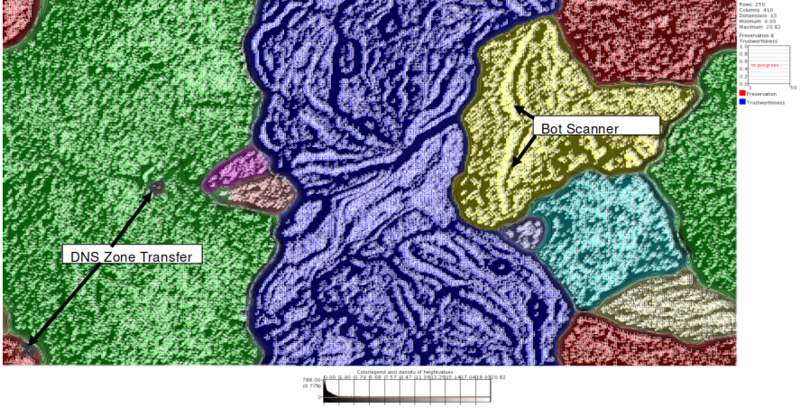 The constant IATBINBu defines the upper boundary of a section while IATBINWu denotes the bin width. Thus, the resulting distribution can be expanded or shrinked to your linking. If more than 6 sections are necessary add new defines and range definitions. Nevertheless, especially for statistical classifiers or unsupervised learners, such as ESOM a vector of constant dimensions is more appropriate. 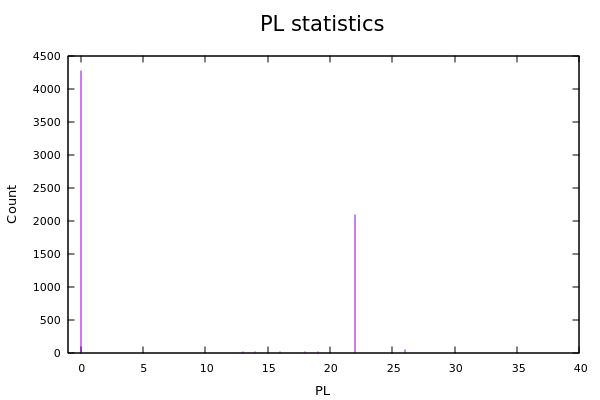 For that reason the descriptiveStat plugin was created, supplying PL and IAT statistics vectors up to the 3rd moment. For each flow of a certain class such a descriptive vector can be fed into a C5.0 or any Classifier for training and testing. As our small example is not diverse enough, an example of ESOM clustering of unknown 2GByte 1.7GBit/s traffic processed by T2 is depicted below. The resulting map arranges the unknown traffic type into regions, using only the PL descriptive vector. The training of the map is derived by our own high performance post processing tool traviz3. Nevertheless, any AI tool can produce the same results. Maybe not with the same speed, but for research purposes they will do their job. Just import the PL vectors of your traffic of choice into weka or matlab. The flow index, the flow direction and the time processing can be selected in order to produce the appropriate signal for your purpose. You will see its application during the tutorial. Let us now discuss some prominent features of the plugin. So apply the script to the flow file, select flow index 1 and move it to another name, we will need it later on. In order to classify encrypted applications, normally the first 5-10 packets bear enough information because the initiation protocol reflects itself in these first PL_IAT sequence. N depends on the type of job at hand. For the first pcap supplied on the page N=20 is enough, for the second one we will need a bigger value. Nevertheless, you can select any N to your liking, just keep in mind T2 has to hold all vectors times the amount of flows in memory. So the performance of your machine is also a factor. 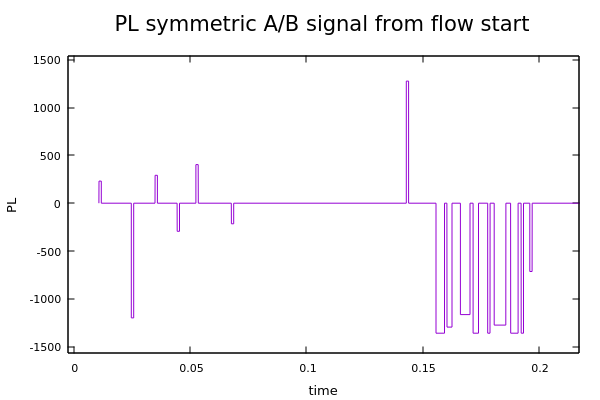 The signal processing approach treats the PLs of a flow as a digital signal. 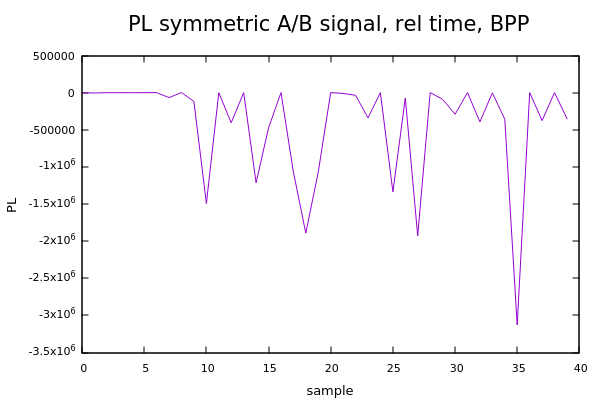 Due to the fact that packets do not appear at regular intervals, the resulting signal has missing samples (s. fig below). Now set NFRST_IAT to 0 and recompile, rerun T2 and use the script to produce a signal for A flow index 1. If NFRST_IAT is 2 then a signal vector is produced with absolute time stamps. 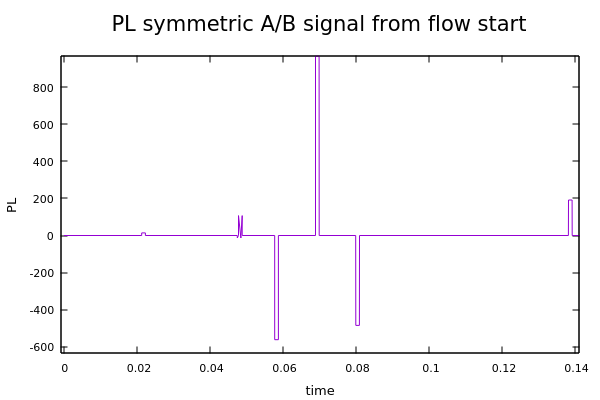 Recompile, rerun T2 and use the script to produce Signal with A positive, B negative PL of flow index 1. Signals are represented by complex numbers, they have amplitude and phase, a fact constantly ignored by some researchers. Nevertheless, due to the nature of internet traffic sometimes a quick fix by omitting time makes classifiers more resiliant. 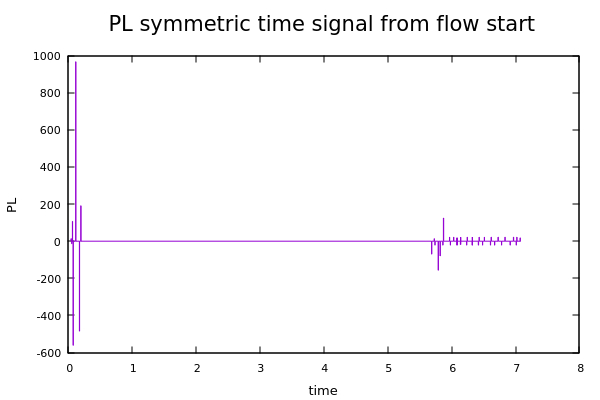 Hence, the script fpsGplt has an additional parameter to replace time by an integer count, so a vector is produced by equidistant PL values, as depicted below. It is obvious that the spectrum of the signal is now drasticly distorted, but the vector can be easily processed by any AI which requires abstract vectored input. Nevertheless, from the signal processing standpoint this representation does not make so much sense, unless the number on the x-axis where correctly sampled values. So how do we get there without much computational effort? One obvious approach is to pick the smallest IAT and use 2/IAT as a sampling frequency which often produces large vector dimensions and slows the classification process down. Another approach is to reconstruct the signal with well known methods already used in radar technology. Here, a sampling frequency is picked outside a bandwidth limited signal according to shannons requirements, which contains most of the energy of the original signal (Gerchberg Papadopulous). Been there, done that. Lots of computational effort, requires specialized HW if really being considered. But, then the missing samples can be reconstructed with a much lower frequency, producing less samples. So a less expensive and easier way is required which almost satisfies dear old shannon, and it has to be implemented in tranalyzer in a performant way. Satisfying Shannon is easy, he is dead, satisfying the Anteater is more difficult. 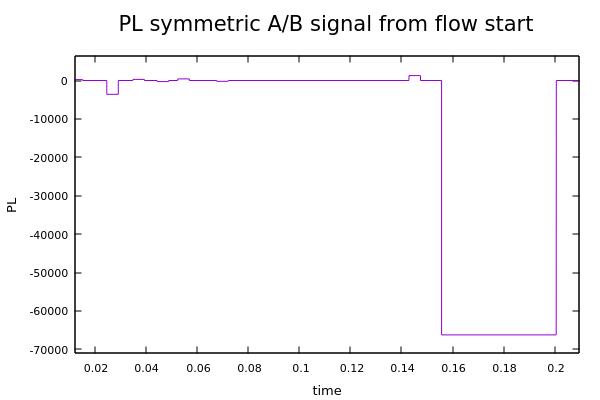 The representation of a packet flow into a signal is vital. 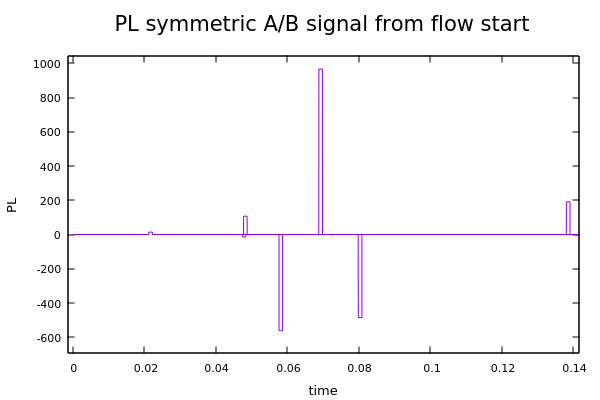 One method is to produce an A and B flow signal as depicted below. In order to preserve the causal correlation between B and A Signal the B part has to be shifted by the start of the B flow. We will see later that there are complications by just combining A and B Flow into a signal, because the full duplex nature of the IP protocol and asymmetric delays of the peers do not guarantee causality between A and B packets. Leaving that aside, for the sake of simplicity let’s first produce a signal which we can investigate and plot. 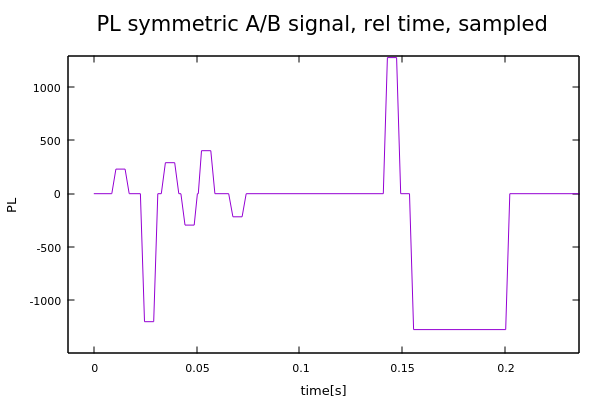 Zooming into the first part of the Signal (right mouse click defines the area) we see a small B spike followed by a larger A Peak. The smallest difference between A and B peak normally defines the minimum sampling frequency, which we like to be as low as possible to reduce the amount of unnecessary sampled 0 and for performance reasons. 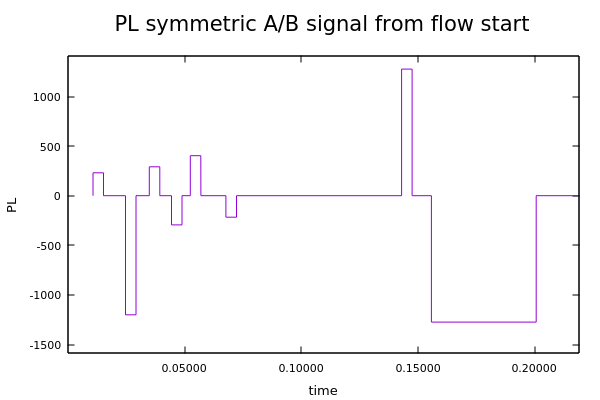 Let’s see what happens if we omit this A-B packet minimal interdistance information and treat each flow separately too produce a signal which can be readily sampled with a lower enough frequency. 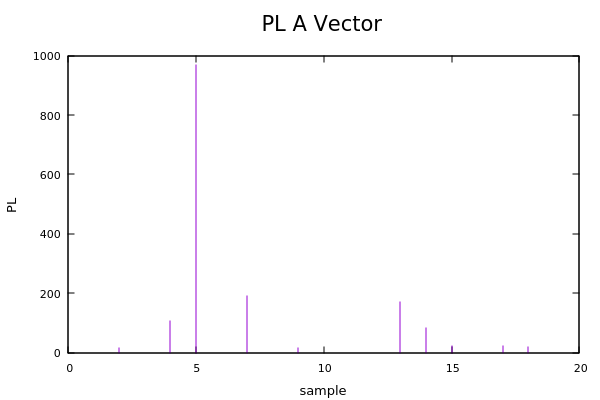 Have a look at the PL_IAT vector above and pick the minimum required pulse length for your sampling frequency. Looking also at the Plot above you will notice the bursty nature of the packet length signal. The task is to replace the spikes with an appropriate pulse length allowing a minimal sampling frequency? Looking at the sorted IAT list above, a drastic jump at 0.009251 can be identified. Thus any aggregation IAT below 9000us would be fine. Lets choose 2000us because 1ms is a reasonable unit for voice traffic. The minimal default pulse width is defined by NFRST_MINIAT(S/U)/NFRST_MINPLENFRC in nFrstPkts.h. The default value of NFRST_MINPLENFRC is 2. 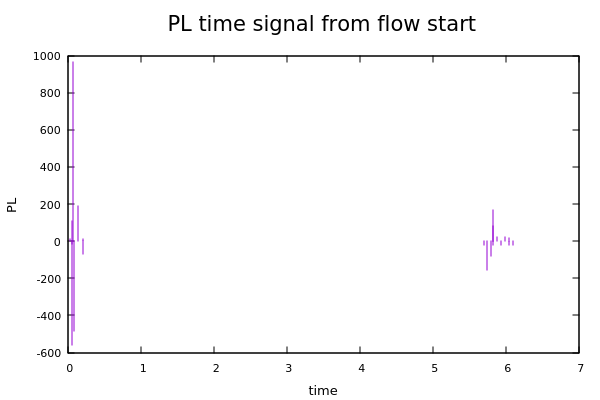 Now invoke t2plot using the -pl option, so that PL values are connected. This facilitates the recognition of signal characteristics. Note that around 0.044s an A Pulse is overlapping the B Pulse. That is the effect mentioned before that IAT between A and B packets are not considered, to avoid high sampling frequencies. Sure enough this is what needs to be done if we are really interested to be thorough. 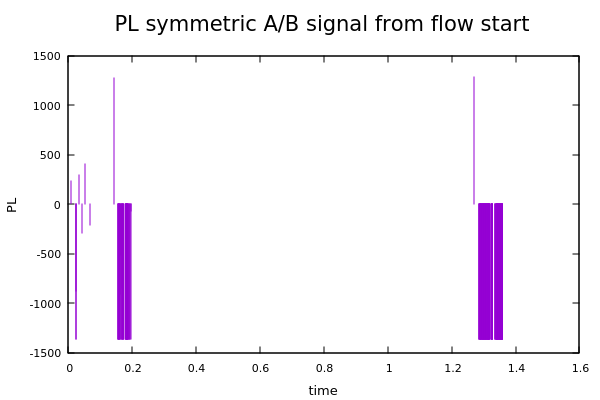 An easy way to mitigate this effect is to consider A and B flow separately. One approach is to shift every conflicting B Puls to the future, which tampers with the phase of the signal. For classification purposes a pragmatic choice. For signal freaks an nogo. They will get the minimum A/B Spike IAT and use a fraction of that as a puilse length. This option will be integrated in the version 0.8.2 of nFrstPkts. 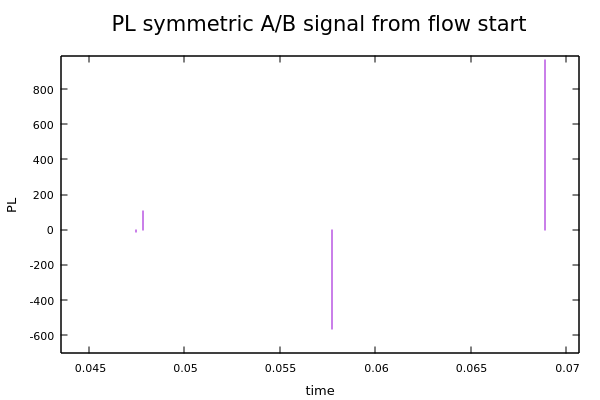 Because the A/B vectors are stored in sequence thus the -pl option in t2plot plots lines crossing the pulse at 0. 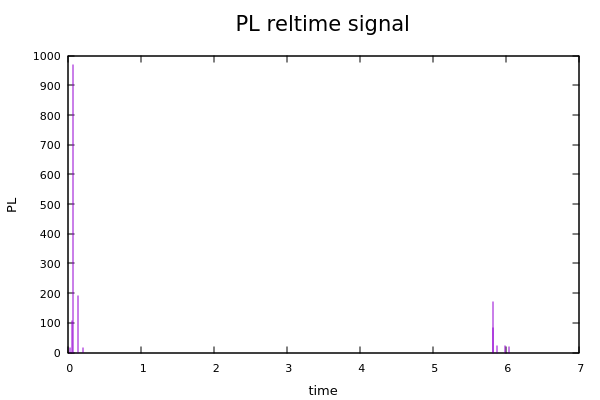 To produce a consistent signal sorting by time is required. 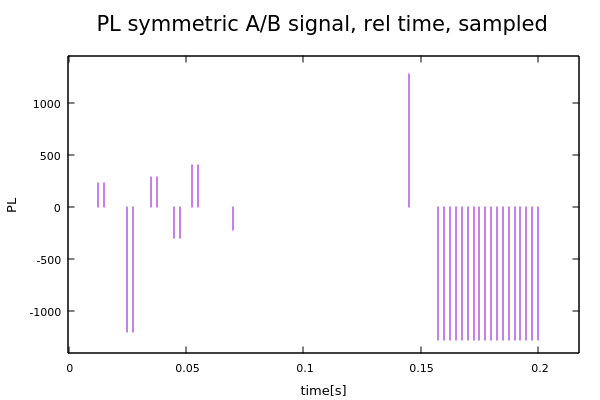 The peaky signal around 0.044s is the overlapping A/B signal effect described above. You can add the L3/4 header length to the PL by setting NFRST_HDRINFO. But then all discussed signal forming modes will be deactivated. The NFRST_XCLD controls the exclusion of a certain PL range. The range is defined by NFRST_XMIN, NFRST_XMAX. This is useful when certain PLs are not relevant for the classification process. Instead of weeding them out by the classifier itself, we can remove them before, thus reducing the size of the model or facilitating the feature extraction process. Now download a more complicated pcap where somebody streams a film. So lets try 2000 for a start and set NFRST_IAT to relative mode. This is one way to reduce the amount of sidelobes in the spectrum. Let us now sample the signal with the default edge. The -p factor defines the IAT in [s] of the sampling pulses. 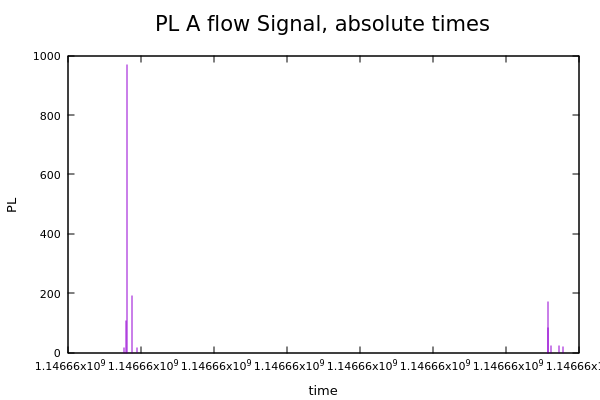 So you see, gnuplot does not show the PL 0 in the chosen plot mode, but they are there in the sampled file. Choose a higher NFRST_MINIATU according to your detail requirements of the classification process, remove the time info and you have the Bytes-Per-Burst (BPB) measure. If you need it non inverted, omit the -i option. That is discussed in our next AI tutorial, which is currently being written. If you cannot wait, put the following vectors into your AI and see how it performs. And, important, give us feedback.